The Wayzata Symphony Orchestra was born on August 11, 2009. Present were a group of talented, dedicated musicians who had experience playing together in Wayzata, but needed a brand new life. The musicians wanted a true community orchestra that connected with its audience and became a part of the community through its music. Agreeing on the right direction to go (forward! ), that night the musicians became the Wayzata Symphony Orchestra. During that remarkable evening of collaboration, the WSO Board of Directors was formed and the orchestra officially moved forward with its 2009-2010 season. 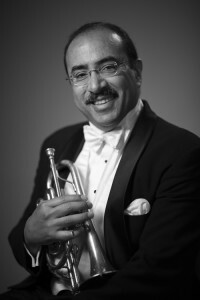 The initial actions by the board were vital to the life of the orchestra: file the necessary paperwork with the State of Minnesota; secure the relationship with the Wayzata Community Church; establish the season schedule; confirm a full roster of musicians; and identify the four guest conductors required to make the season happen. The energy in the hall at the first rehearsal of the Wayzata Symphony Orchestra was infectious. Musicians were smiling, laughing, and greeting each other with hugs. That energy was matched only by the afternoon of the WSO’s first concert later that month. Friends and family of the WSO were as eager as the orchestra members for the performance to begin. That same energy continued throughout each concert during the first season. Each performance proved the WSO was on the right track. Audience size continued to grow as the word got out about “the little orchestra that could”. At the conclusion of Season One, orchestra members voted to invite Marlene Pauley (pictured right) to be the WSO’s first music director. Marlene was selected due to her high level of musicianship, her belief in the WSO and its members, and her incredible ability to lift the music off the page. 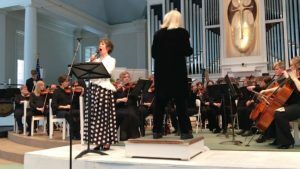 She was able to challenge the musicians in the orchestra, create an entertaining performance for the audience and educate everyone about the music and composers. The WSO’s Season Two was a smash hit with concertgoers. Featuring the Minnesota Orchestra’s principal clarinetist, Burt Hara, and The Edina Chorale, the WSO played for packed houses. Also during this season, the musicians were hard at work behind the scenes, applying for the group’s first grant, which was awarded by the Metropolitan Regional Arts Council for the November 2011 concert in Season Three. Season Three in 2011-2012 was filled with a variety of guest artists that ranged from age 10 to 92! The WSO musicians were joined by guest artists Anthony Ross and Beth Rapier, principal and assistant principal cellists with the Minnesota Orchestra, for their season opener. 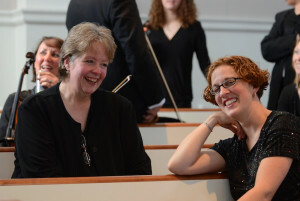 The “Music of Difference” performance capped off 2011, with support from the MRAC grant and music by Robert J. Bradshaw written for guest soloist Catherine Branch (pictured left). While Bradshaw and Branch were in the Twin Cities, they also spoke to students at various schools, discussing the challenges and rewards of playing with a disability. The second half of Season Three showcased 10-year-old piano phenom William Yang, and guest artists Elsa Ludewig-Verdehr and Walter Vedehr on clarinet and violin. The Season Three Finale was an amazing collaboration with local jazz artists Irv Williams and Peter Schimke on tenor sax and piano, while the music of Ellington and Strayhorn rocked the house. Serving up concerts to thousands in the Twin Cities, Season Four marked consistent full-house attendance at WSO concerts. 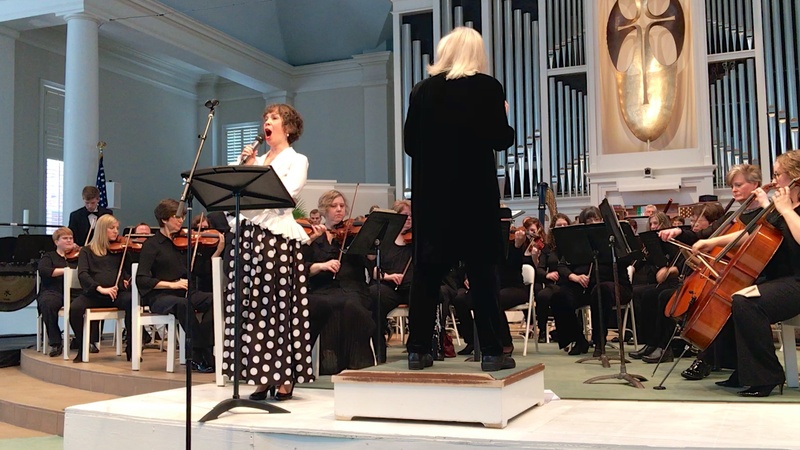 Five concerts were offered, with a repeat added performance of Carmina Burana at St. Andrew’s Lutheran Church in Mahtomedi – in the opposite corner of the Twin Cities from Wayzata. In addition to Carmina Burana, which featured the Edina Chorale and Minnesota Boychoir, the WSO performed with the ANCIA Saxophone Quartet, Manny Laureano (trumpet, pictured left) and Kaleena Miller (tap dance). Season Five was thrilling, with the return of Tony Ross (Principal Cellist, Minnesota Orchestra), and WSO debut of Erin Keefe (Concertmaster, Minnesota Orchestra) on Mozart Violin Concerto #4. Bruce Henry joined the WSO to sing spirituals. Gershwin, Rhapsody in Blue and world premieres of Daniel Kallman’s Sea Creatures plus a new piece for the Minnesota Boychoir capped off the season. Season Six welcomed Osmo Vänskä from the Minnesota Orchestra in the fall, who stepped away from the podium to play Mozart’s Clarinet Concerto. Just one month later, it was “never say never” time as the orchestra performed Bartok’s Concerto for Orchestra, a difficult piece that challenged the musicians to the core. Heading into spring 2015, the WSO performed Verdi’s Requiem alongside the Edina Chorale and the Two Rivers Chorale, featuring four Minnesota Opera guest soloists at Orchestra Hall to a full house (pictured left)! The musicians topped off their 2014-15 season with a family-friendly concert that featured Pirates of the Caribbean (and a visit from Jack Sparrow himself!). Season Seven had fantastic guests artists once again as Minnesota Orchestra’s Principal Flute, Adam Kuenzel, and the Twin Cities’ own songbird, Maria Jette (right) took the stage. Tori Okwabi (Principal Clarinet, WSO) won the Concerto Competition and was featured during the November concert. Season Eight marked some fantastic performances and another trip back to Orchestra Hall! We started our season playing with the pros from the Minnesota Orchestra. Joseph Peters (Principal Oboe) joined us in October, followed by Tony Ross (Principal Cello) in November. As we leapt into 2017, we were thrilled to be back for another performance at Orchestra Hall for the beauty and power of Brahms’ Requiem (joined once again by The Two Rivers Chorale, the Edina Chorale, and some fantastic soloists). Our final concerts of the season in April and May soared to new heights (right into space!) with Holst’s The Planets. Season Nine was included WSO performances by Erin Keefe (MN Orch), Tony Ross (MN Orch), Andrew Staupe, Fernado Meza, Benjamin Sieverding, and Explorer Ann Bancroft. The final concert series of the season featured an entire concert of Shostakovich! Season Ten will be celebrated not only for its significant numerical milestone, but because of the incredibly talented guest artists we have on deck! Don’t miss hearing a grand lineup of professionals join the WSO: Osmo Vänskä, Manny Laureano, Tony Ross, Dean Sorenson, Chuck Lazarus. Can you believe all of this is happening in just one glorious season? In November, our concerto competition winner and concertmaster, Marion Judish, will take the stage. Looking to 2019, we’ll be back for our third performance at Orchestra Hall in February! After Tony Ross performs Weinberg’s Fantasia for Cello and Orchestra, we’ll continue the collaboration with the Edina Chorale, the Two Rivers Chorale and guest artists Tracey Engleman and Jerry Sundberg to fill the house with Vaughn Williams’ Dona Nobis Pacem. We’ll cap off the season with a creative collaboration to end the season with a bang. All WSO performances are FREE, no ticket required. Donations gratefully accepted. 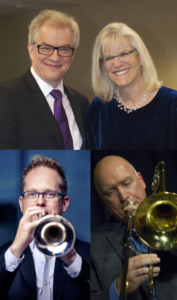 Join us for receptions after each concert to meet the guest artists and musicians. The WSO is a 501c3 nonprofit organization.